The fun-time, anytime, read-aloud Bible rhyme! Boys and girls love the soothing sounds of rhyme. Now toddlers have a rhyming Bible created just for them! From the story of creation to the resurrection of Jesus, this is the perfect choice for parents who want to introduce their toddlers to the Word of God. Joyful pictures and classic stories told in vivid verse make this a sure favorite that will entertain your young ones and teach them biblical lessons that last a lifetime. The Rhyme Bible Storybook for Little Ones by L. J. Sattgast is adorably cute! The Rhyme Bible Storybook for Little Ones by L. J. Sattgast teaches Biblical lessons to toddlers through rhyme. The illustrations are beautiful and keep my toddler's attention throughout the book. 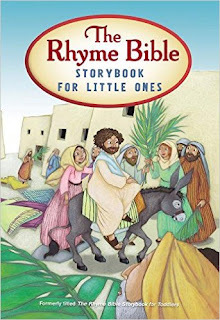 I love that The Rhyme Bible Storybook for Little Ones by L. J. Sattgast is a board book because that means I can let my toddler look at it without worrying that it will get destroyed. This is the perfect way to introduce toddlers to stories throughout the Bible. You can find The Rhyme Bible Storybook for Little Ones Board book by L. J. Sattgast on Amazon, Barnes and Noble and other bookstores.